The Re-Chord Soloist mode puts solo players up against three varying levels of difficulty. The Automa's actions are being added to the current Chord cards and are very simple to follow. A full PDF of solo rules and Video of Solo play will be available very soon. Varying strategies based on genre. Incredibly easy to play, difficult to master. Not a highscore solo mode, a real Automa opponent. 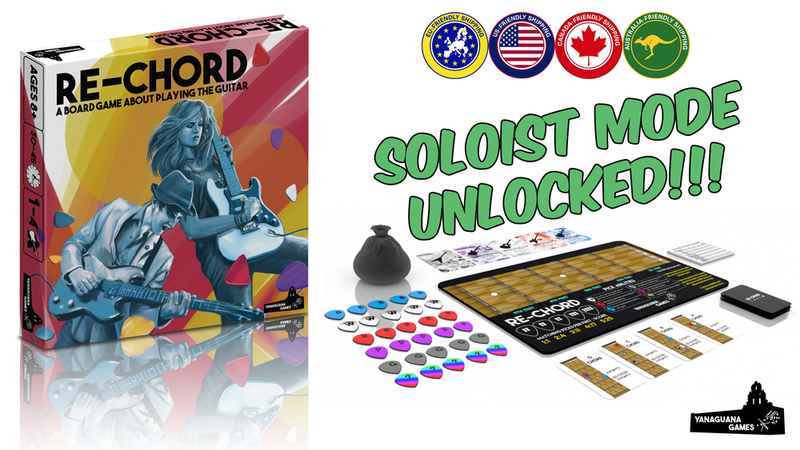 The soloist mode was developed following Morten Monrad Pedersen's "Automa Approach" which is the amazing solo design theory behind Jamey Stegmaier games like Scythe and Viticulture. We'd like to thank Morten and Jamey for giving us their blessing to create a heavily inspired Automa opponent and solo mode. The Automa doesn't perform any actions that a player wouldn't be able to do, however it does get multiple genres at every difficulty level. I've personally been playing the solo mode a ton lately. It's brutally difficult at the hardest level, and incredibly fun at it's easiest.